AQUAQUICK 2000 is an environmentally and user friendly water based product that is being used for a dispersant, degreaser, surfactant, and fire extinguisher. And it is suitable to biodegrade and remove all vegetable, animal, mineral, and synthetic fats, oils, and greases. AQUAQUICK 2000 has been tested and approved by multiple international independent research institutes.AQUAQUICK 2000 has been found to completely biodegradable (100% biodegradation in less than 21 days remaining only CO2, H2O, and Biomass), and non-toxic to aquatic organisms (min. 2% dilution) and non-irritating or corrosive to human eyes and skin. 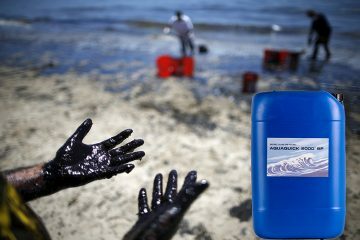 AQUAQUICK 2000 is mostly sold to the oil industry where its applications of platform cleaner and oil spill dispersant are only over shadowed by its use as a natural fire extinguisher.It is also being sold as a road surfactant degreaser after oil spills or accidents.It is used by the food industry and other various industries as a general cleaner and degreaser for food production surfaces and floors, as well as a hand sanitizer and cleaner for the workers.AQUAQUICK 2000 is a super concentrate, with a minimum dilution rate before of 2% (1:50). Diluted AQUAQUICK 2000 is 100% safe for the user, non-toxic to aquatic organisms and is 100% biodegradable. AQUAQUICK 2000 SP is an user and environment friendly cleaning product which is very suitable for the removing and cleaning of all mineral, vegetable, animal and synthetic, oils and greases (hydrocarbon). 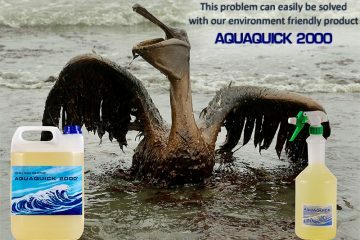 Opposite to AQUAQUICK 2000, AQUAQUICK 2000 SP does not accelerate the biodegradation of hydrocarbon pollutions. AQUAQUICK 2000 SP is a fast splitting surfactant/degreaser that has been developed for situations where the wastewater is being drained in to the sewage system or environment while using a grease/oil separator. The product has been tested and is approved by TUV in Germany, who concluded that AQUAQUICK 2000 SP meets the guidelines regarding the German regulations and requirements for fast splitting cleansers and measures for biodegradability and bioaccumulation. AQUAQUICK 2000 MPC is a revolutionary, water based cleaning product, that is composed out of ecological materials and plant extracts. The product is very suitable for the elimination of all animal, vegetable, synthetic and mineral oils and greases (hydrocarbons) in a 100% environment friendly way. AQUAQUICK 2000 MPC contains special nutrients that create an explosive growth of the bacteria en microorganisms that are present in the environment. These bacteria normally require a carbon source for their metabolism process to grow and to multiply. Therefore these bacteria are capable in converting the AQUAQUICK / hydrocarbon emulsion in a biological way in to harmless components such as CO2 (carbon dioxide), H20 (water), Biomass and energy. This is an aerobe (consumption of oxygen) process. Thanks to the special composition of AQUAQUICK 2000 MPC, it is harmless in use and does not cause any particular health risks. In the minimum dilution rate (2%), AQUAQUICK 2000 MPC is to be considered as non-toxic to aquatic organisms (IMO regulations). Also AQUAQUICK 2000 MPC does not affect or damage metals, plastics, paints, coatings, rubbers, etc. Before use, AQUAQUICK 2000 MPC has to be diluted with water (both fresh and sea water can be used) in a dilution rate from 1:50(2%) up to 1:600 (0,17%).